Here’s a new set of watercolor illustrations. As you’ve probably noticed if you’re a regular blog visitor, I love color. The more of it the better! Rainbow is my favorite color and that’s why it was a joy to work on these hands yesterday. You can find them in my store or on Creative Market. I’ll add a smaller set to Etsy over the weekend. Above are a few random deco paintings for various art traders little books. Actually, I think the dog was an ATC. Tradeable art at any rate. It’s a mix of watercolors, acrylics and mixed media pages. Happy PPF and have a great weekend! What I’m working on… birds! Cute ones. Today I’m working on a cute set of whimsical folk art style birds. They’re lots of fun to paint. And I have to admit, I’d probably rather be painting zombies but no one wants them on their celebration invitation. Or do they? I love gardening and I love to see pretty new flowers sprouting in my garden. These lovely orange beauties came up so I thought I might take a photo and paint them at some point. I believe these are some of the tulips my mother-in-law brought me from The Netherlands. So pretty! Here’s a set of bright and warm daisies. I have tons of these in my garden too. I just love daisies, they’re a simple flower but always make me smile. There’s a small set on Etsy and a larger set in my store and on CreativeMarket too. Above are a set of art hands I made for a trade with other artists. They’re about 6″-7″ tall and are made with a thick cardstock and pretty patterned paper backing. All are watercolors except for Brain Freeze which is markers and ink. I enjoyed making these and can’t wait to see the ones I’ll receive in return. I think a big set of them would look amazing in a frame. This is a watercolor set I painted recently featuring pretty green and blue abstract flowers. I bought some new blue and green paint that I absolutely LOVE! It’s the Winsor & Newton professional series and the colors they have are so saturated and bold. A bit pricey but well worth it for vibrancy. This set of graphics is available in all of my stores though the set at Creative Market is a larger package that comes with more graphics and seamless background papers too. Here is a pretty set of colorful floral abstracts. I had so much fun painting this set. It’s not really my regular style as I tend toward more realistic type of flowers. But I wanted to try something different and more… well, painterly. Watercolory. That’s a word. I think these flowers are fresh and bright and would look cheery on shower invitations or as wedding florals too. You can find them in my store here. Or on Creative Market too. These roses will make up the bulk of my next set of watercolor graphics. A pretty rose set for wedding invitations, showers, printables, etc. The usual. 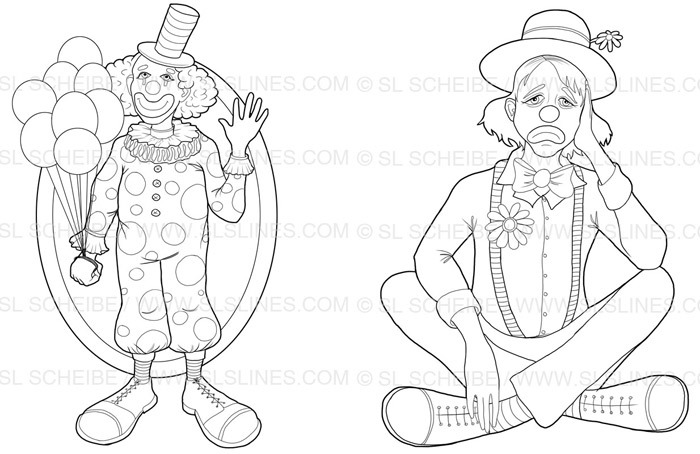 While playing Call of Cthulhu last night, I had the chance to work on a couple of clowns, one sad and one happy. 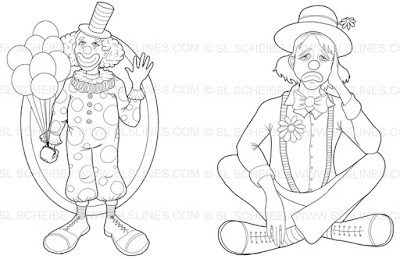 I couldn’t quite bring myself to make an evil clown because…. eewww…. creepy! I read Stephen King’s It and I had to sleep with the light on for a week. I’m not going there again. But happy and sad I can do. This pair is available in the store now. New art, new graphic sets! It’s been a busy time for me. I’ve been hard at work on various art projects and new graphic sets and so I’ve been a bit lazy about blogging. Ooops! Hopefully I can get things back on track and start producing some regular content from here on in. I’ve been making a lot of watercolor clipart lately and here are two of the newer sets – whimsical rainbow flowers and dark gothic wreaths. Hmmm… they’re polar opposites on the floral theme scale, I see that now. LOL. But both are fun for creating commercial products (yes, they’re fine for using on PODs) and invitations too. I’ve also opened a new graphics store, here: www.slslines.com. I still have my Etsy shop of course and another one over at CreativeMarket but it was time to put together a store of my own and direct my promotion efforts there. On the art front, I’ve made tons of Artist Trading Cards of course. I’m always up for trading and I will get around to posting some of them soon. I’ve also made quite a few postcards, paintings, life drawings, the usual. And a 8 page short comic! I have been busy, just a really bad poster.